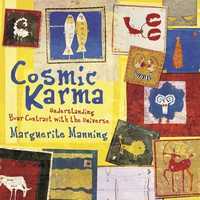 In Cosmic Karma, Marguerite Manning states that before we were born we made a contract with the universe, which is encoded in the natal horoscope. This is more than a belief; she states this as a fact of our existence and explains this worldview in the introduction. Viewing the horoscope from this perspective takes the astrologer away from therapy and more towards self-improvement through introspection and understanding of one's soul. Difficult situations can be seen as karmic residue, rather than anything that happened between you and your parents while you were growing up. With this book, you won't need a professional astrologer to guide you through your horoscope. Anyone who has a copy of their natal horoscope and can find their Sun, Saturn, Neptune, and Pluto will benefit from reading this material. The incredibly accurate descriptions of the Sun in the twelve signs and houses reveal your primary contract with the universe. The Sun is the part of you that shines with experience, and that can show others how to advance. For example, the Sun in Cancer is here to show the rest of us how to cherish and preserve the emotional sanctuaries of home, family, and maternal care. The Sun in Cancer is an emotional mirror, and it reflects the subtle impressions in the immediate environment. The challenge to the Sun in Cancer is-and this is in the cosmic contract-that Cancer is not allowed to ignore emotional boundaries or to obsessively cling to old objects, resentments, or memories. Having a cosmic degree in Cancer means the path to fulfillment is in nurturing others-and sometimes yourself. With tremendous wit and insight, Ms. Manning then goes on to describe the Sun in the twelve houses. The Sun in a particular house describes exactly where you “promised to hit a spiritual home run.” And you can't expect to find fulfillment if you do nothing about the affairs of this house. You are expected to do the hard work associated with this house, and, if you don't, the universe takes it personally. Your life goes into a dive, and you won't get the rewards and success that were otherwise promised. What a marvelous way to present the astrological meanings of the Sun in the twelve houses! You don't get a dry, this-equals-that kind of description, but rather you get choices, and you succeed or you fail according to how well you make those choices. In this way, astrology offers you a roadmap of what you need to do to maximize your potential. In this system, you're not treated like a neurotic or a clinically depressed psycho, but someone who is a significant player in the game of life. The concluding chapters include material on Saturn, Neptune and Pluto in the houses, as well as the conditions in your twelfth house, known here as your karmic closet. What I like about this book is that it shows how individually we are all connected to a larger whole, some kind of universal intelligence. All the significances given to each planetary placement make perfect sense, especially when considering the Big Picture. Nothing happens by accident, and the people we have constellated around us reflect our own karmic lessons and life purpose. We are here to learn and grow, and those who feel trapped or stagnant just aren't paying attention to their astrological map, which is our contract with the universe. Buy Cosmic Karma, Understanding Your Contract with the Universe.